Is reconciliation possible between the few opposites I have listed below? Is there any value in uniting those opposites? Is there a centre? Are they opposites or do they belong to each other, two sides of coin, part of a larger cycle? They seem to lie so far apart from one another and we may inclined to identify with one side of the pole over the other; if not for ourselves, then we view the one pole as more ‘ideal’. But, like the moon, we darken and there are times that the devil gets into us and we enact in some way our darker impulses and then we wonder how we, ‘angels’ as we view ourselves, or the person who we thought was ‘above’ such action could have been so devilish. Somehow the unconscious within, seems to act counter to the wishes of the conscious mind. We do meet these opposites in our every day lives. I know from personal experience and from wondering about them as to how it was possible for example, that I could have both the sinner and saint within me. I can be manic one moment and depressed the next. I can feel optimistic about life in general and an incident can have me swinging over to the other side. I know that I can be creative one moment and hugely destructive the next in relation to e.g. food whereby I had been mindful for several days of exercise and good eating habits, then in a fit of something (unconsciousness), will undo all the good that has been done. All the opposites reside within our psyches. We ALL contain the polarities of good and evil, agony and ecstasy, sainthood and sinfulness, bliss and pain. Things are seldom ‘either-or’. When we are racked by conflict, we can be sure that an opposite has been activated within. 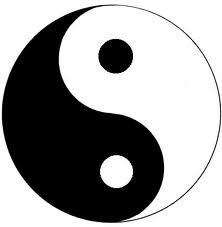 The task is to hold the tension between the two until a symbol reconciling the two appears. After one has differentiated the opposites, a third, uniting factor can appear. Both poles are necessary although at timed we experience only one pole for a while. We sit in that uncomfortable place even if the destructive dimension is more apparent. We know that our weakness can turn into our strength. What we may perceive as our vulnerabilities may in fact be our strength if we can work it out. This is a vast subject and I have definitely bitten off more than I can chew. It was an over reaching on my side to attempt to write about this in 500 words or less. But I hope that this brief glimpse into the opposites gives you something to chew on. And I sincerely hope that from the tragedy of the Boston bombing, for the survivors and their families, for all those grieving and for all of America, some light will shine on this terrible darkness. What a wonderful post. And yes, we have a little bit of both in us- which side we allow to prevail whenever there is a conflict is probably what makes us who we are. Thanks so much Natasha; you hit the nail on the head. The prevailing one though does take some conflict as you say! So true. Opposites are within us but the healing part is knowing what lies within us. When we know then we are not surprised and can face it. As you have so beautifully said, and I quote, All the opposites reside within our psyches. We ALL contain the polarities of good and evil, agony and ecstasy, sainthood and sinfulness, bliss and pain. Things are seldom ‘either-or’. When we are racked by conflict, we can be sure that an opposite has been activated within. The task is to hold the tension between the two until a symbol reconciling the two appears. After one has differentiated the opposites, a third, uniting factor can appear. Great thoughts. Every morning at the end of my meditation, I ask for ballance between men and women. That part is a fraction of the whole. We need to work twards ballance in all things. I picture the scales of justice, swinging from good to bad. Thank you Francene for stopping by and how great to ask for balance between men and women ..
Just a bit of a jump here – did you mean ‘I picture the scales of justice, swinging from good to bad’? This may be the reality – I would be a lot happier if they swung from bad to good? That was so incredibly well-stated! As a writer, developing a character’s core, it’s crucial to include both “light” and “dark” traits – that’s our reality, so shall it be there’s. That’s what makes life *and fiction* so interesting! Thanks Sam! Imagine all just bland and blah! Fact is sometimes stranger than fiction – I guess that fiction is a great way to bring out characters using light and dark – triumph and loss and zillions of others! You’ve done it again Susan…fabulous post. You are so right that all of the opposites live within us…no matter how much we try to deny it. I do not even try to deny anymore. While I do my best to be a decent human being, there are times when I’m off the charts ridiculous and I know it. Sometimes I try to rein it in and other times I just let it rip. I love this post! When I think of opposites, it makes me think of how I’m friends with many people who are opposites. I have this thing about wanting my opposite friends to be friends with each other, but it doesn’t always work out. Wow Susan, you are amazing, I love the dark moon analogy, it speaks for itself. Your coin description also makes it easy for me to understand why I choose that opposites belong to each other. Love and Hate are basically the same thing on a different coin than big and small. Great post, I could read every word again. That is such a lovely comment Ida, thank you so much! I’ll be popping into yours later – once I’ve done my ‘P’. Susan, your post definitely gave me food for thought. Sometimes I find myself bouncing like a ping pong ball between darkness and light. Some how I think it keeps me on an even keel as that way I HAVE to look for the light. If we don’t look for the light it is too easy to fall into that crevass of darkness never to climb out. Thank you for your loving and insightful post. Hello Gwynn and thank you so much for commenting, you know how much I appreciate this! The ping pong ball image is great – you should use it in your writing! It’s true, it can be easy enough to fall into the crevasse – sometimes though it’s ok to just sit in it for a while until something shifts – i.e. to not run away from it. Thank you so much Sherrey! So important to see in the ‘other’ those qualities of which we have some; yet other qualities so different to our own. I also look forward to further contact after the A-Z. I still have to decide which one to do .. ‘Psyche’? ‘Peace’? Thanks for an interesting and thoughtful post, Susan. Very rarely are things either-or, just as there are always two sides to a given story. Perspective is everything. Thanks Dot – two sides at least, maybe even three or four etc! And you’re right, perspective is everything, attitude is all, timing is all ..
Is ‘perspective’ your ‘P’ word? It’s a good one! It occurs to me that your list of opposites represents one unifying rule — that none of these extremes can exist without its polar opposite. Each requires the other to be of any significance. And our own lives are balanced somewhere in that delicate middle. That high wire act of choosing between temptation and the path of least resistance is our age-old battle and we will soldier on through til the end of our days. Thank you for your thoughtful and meaningful post. And thank you for your kind comments on my “Nightfall” post. Thank you Michael for stopping by! They can’t exist without the other can they? It is hard work to find the middle distance and you’re right, we’ll be working them out forever! That’s a good one Felicity thank you! Truth in those words! Opposites are the push and pull of nature. To be balance is to be aware of the opposites that are prevelant within and without and to know that all things are interconnected. Nothing is separated nor are we. We feel a loss that 8 year old Martin Richards was taken away too soon because we are connected without even knowing Martin. You said it in a few words Elizabeth thank you. All is connected and it too sad about young Martin and his family. We all feel the loss of his young life taken too soon. All of life is conflict, and the quality of our lives depends on our choices, there’ve been a few made where I didn’t even realize, with hindsight, that I had a choice. You could explore this theme a lot further – good post! Thank you Elizabeth! Conflict is central and not necessarily just on the war front. Making wise choices free from hidden agendas is ONE of our tasks in life! So true, Susan. I often think of myself as being above a certain negative emotion or feeling. I pride myself on being a calm individual and then suddenly I lose my temper. We do have a host of opposite natures within us, and the side that wins is the side that we encourage. Thank you Cynthia for stopping by .. I appreciate this. But what if the temper side wins? Just asking? I can stay in a sulk for days ..